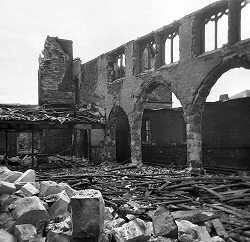 The second half of the seventies were a turbulent time in the life of the Church as a major fire, on the 19th July 1975, destroyed the Church building, leaving only the halls in a usable state. A new minister had just been appointed prior to the fire, the Rev. Samuel McNaught who led the Church for the next 27 years. The minister and the congregation decided to raise funds for a new building which would be started the following year. Donations arrived from all over the country. This picture, to the right, shows the inside of the Church on the day after the fire. 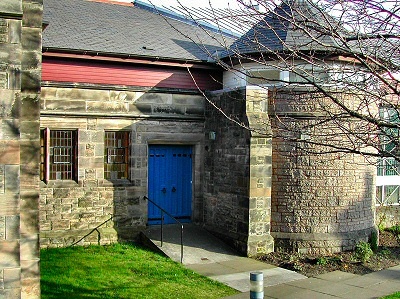 During the rebuilding works, Church services were held in the canteen of Meikle's Carpet Factory a few streets away in the old Caledonian Mills, the original home of St. John's congregation. The original foundation stone was found in the ruins containing the two glass bottles and newspapers from 1907. On the 23rd October 1976 the foundation stone was laid, with the original 1907 papers stored inside at a special outdoor service. By autumn the next year the new Church was ready with a Dedication Service held on 10th September 1977 with dedication by the Moderator of the General Assembly, Rt. Rev. John Gray. The new building, shown above, was joined to the original halls and can hold up to 450 people. The final cost was £96,000. Many events were held to raise the funds including concerts, socials, sales of work, sponsored walks etc. A special summer fayre was held at Kirkcaldy Cricket Ground (now a housing estate!). There was even a 20 mile walk (16 laps) around Beveridge Park. A total of 87 walkers comprised members of the congregation, the Brownies, Boy's Brigade, Sunday School, Young Wives and Mothers Group, Woman's Guild and the Men's Association. Local schools also raised funds with the North Primary, aided by three classes from Torbain School, organising a Treasure Hunt. During the year, the Boy's Brigade formed a new group, The Robins, for the 6-8 age group. In 1978, the BBC arrived to film the Easter service where the minister interwove the Easter message with the story of the Church fire. In the evening a 'Songs of Praise' service was filmed and included the Combined Church Choirs of Kirkcaldy and the Choir of the North Primary School. 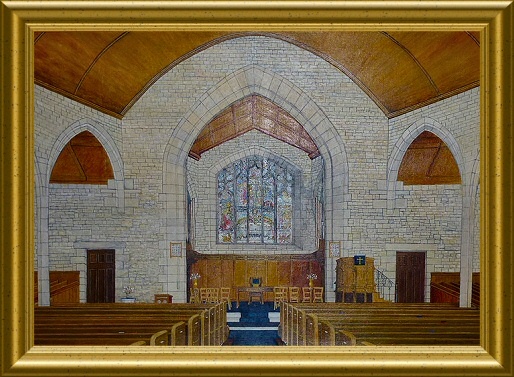 This fine painting of the old St. John's shows the stained glass window and was originally painted in 1972 by Mr Robert P. Johnston of Kirkcaldy. This newer version, from 1978, hangs in the main vestibule to this day as the original was lost in the fire. A new crèche for babies was introduced in 1979 and the Boy's Brigade camp was held in Holland. The Women's Guild celebrated their Golden Jubilee at the Station Hotel in Kirkcaldy. In 1980 the rock musical "Joseph and His Technicolor Dreamcoat" was performed during a morning service by the younger members. The young people of the Church were very active and sponsored two children in the Middle East as well as holding sponsored cycle runs and hosting an Open Day. A 10th anniversary was celebrated by the Young Women's Group. The annual Christmas fayre, held in mid November, was still a key date in the Church calendar with good support from the local community. The Thursday afternoon 'Get-Together' group was formed to combat loneliness in the community, which still meets today. As well as tea and chat, games such as scrabble, whist and dominoes are played. During the summer of 1981, the minister exchanged pulpits with Rev. Calvin Cooper from the USA. Further exchanges were held in 1983 with Rev. Lee Simcox of Mankato, in 1986 with Rev. Edmund Loew of Arizona and in 1989 with Rev. Dr. Conrad Hyers of Minnesota. The Church was improved in 1982 with new speakers and microphones, welcomed by the hard of hearing. The Boy's Brigade held the centenary of their organisation in 1983 while the Women's Group started afternoon meetings. The time of Sunday service changed from 11.15am to 11am during 1985 and a new Project Committee was set up which organised tea and coffee after the services. They also arranged to install a sound system into the large hall. After a donation from Mrs A Darling, the Men's Association received a new set of carpet bowls and a rose bowl trophy. To assist with Bible Study, a lending library was started. 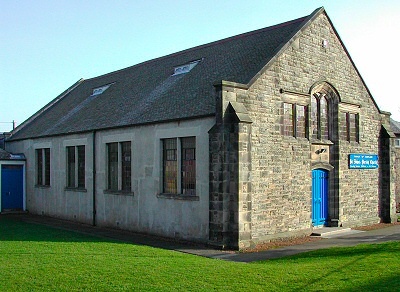 Also during the 1980s a new Manse was purchased and 10 years of the new Church building was celebrated. New activities included Scottish Country Dancing. As with all new buildings, problems do occur, so additional fund raising was required to repair the original lightweight roofing material which was made of noise absorbent foam with a covering of aluminised felt. 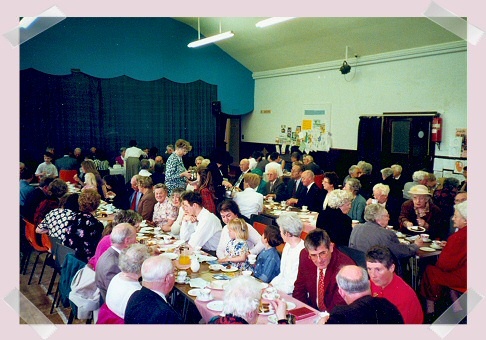 A grand fete was held in 1993 to raise funds for the roof repairs to the Church and the halls. The repairs were finally complete in 1996. A new Mothers and Toddlers group started in 1993 (closed in 2013) while in 1994 St. John's joined in the 750th celebrations of the 'mother Church', Kirkcaldy Old Parish Church. 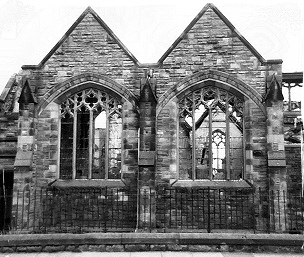 A new hymn, "St. John's Kirkcaldy" was written by Rev. John Millar for the celebration, in 1993, of 25 years service by Rev. McNaught in the ordained ministry. 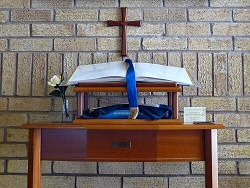 A new 'Book of Remembrance' was introduced in 1995 to which new pages can be added as requested. A bequest allowed a suitable table to be provided to provide a home for the book as can be seen to the right. In 1996 the Boy's Brigade Junior Section held a special service for those killed during the Dunblane incident and planted a memorial garden. In 1997 the Rainbow Guides held a 'Mad Hatters Tea Party' in Balwearie High School to celebrate their 10th birthday. 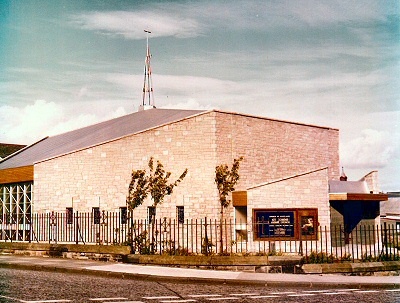 The first flower festival was held on the 21st September 1997 to coincide with the 20th anniversary of the new Church building. A special service was then held surrounded by the flower arrangements. In 1998 a display of Lladro figures depicting the Nativity Scene were gifted to the Church and are displayed in a hand-crafted cabinet. The Woman's Guild was, in 1999, renamed as the "Church of Scotland Guild" with men welcome to attend. There was even a bowls match between the Women's Group and the Men's Association. As the Millennium approached, a history of St. John's in words and pictures was displayed in the large hall at the start of 2000. 2001 saw a "Promise Auction" for Church funds with an evening event attracting many bidders. The bronze plaque commemorating the 2nd World War was found in 2002 after being lost at the time of the fire. It was refurbished and located near to its original position. 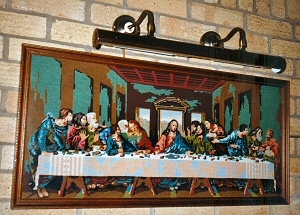 A new 'Last Supper' tapestry was illuminated and located at the side of the Church. 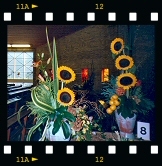 In 2002 a flower festival was held to celebrate 25 years of the new Church building and the retirement of Rev. McNaught. The Church now entered a period of uncertainty until a new minister was ordained.